Written-By – Stock/Waterman*, Titan Sports Inc.
Written-By – Ford*, Stock/Waterman*, Titan Sports Inc.
Written-By – Miller*, Stock/Waterman*, Titan Sports Inc.
Written-By – Ford*, Titan Sports Inc.
Written-By – Paul Waterman, Titan Sports Inc.
12 –World Wrestling Federation Superstars* Slam Jam 12"
Published By – BMG Music Publishers Ltd. Produced for Stock and Waterman Productions Ltd.
All songs published by All Boys Ltd./BMG Music Publishers Ltd.
℗ 1993 exept track 2 ℗ 1992 the copyright in this sound recording is owned by BMG Eurodisc Ltd.
© 1993 BMG Eurodisc Ltd. Distributed in the UK by BMG Records. Distribué en Europe par BMG/Ariola. Vertrieb in Europa durch BMG/Ariola. A Bertelsmann Music Group Company. 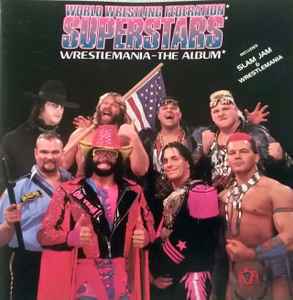 Artist for tracks 1, 2 and 12 on the disc printed as "World Wrestling Federation". Title of track 3 on the disc printed as "U.S.A."